•	Take note of views – we look for both the views to maximize and those to hide. •	Create spaces – we look to make the outdoor space flow with the existing architecture, while separating areas, such as utility areas, etc. •	Vertical area – we take into consideration the use area above the ground plane (tree canopy, arbors, power lines, etc) and create shade or eliminate shade as needed. Also the grade of patios, raised planting beds, use of walls and steps is examined. •	Planting choices and layout – the fun part! We consider seasonal bloom, contrasting and complimentary color, size, shape, texture, sun exposure, soil moisture and deer and pest resistance. •	Lighting plan – if desired, we can create a scheme to extend the enjoyment time of your garden. •	Maintenance requirements – we can design towards your level of desired upkeep. •	Budget restrictions – we understand that budget is important during the design process. After meeting and creating a design, we will present our ideas to you. The reward of our hard work! We love to impress our clients with our creative, unique and artistic design! We strive to use your thoughts and ideas and combine with our design expertise and construction knowledge to present the best possible plan for your property. Sometimes referred to as the work part, but according to our crews this is the fun part since they get to dig in the dirt, use equipment and implementing the work by Digging, leveling the ground,applying manure,planting flowers/lawn,paving and after they have to clean the place before leaving the client's premises. 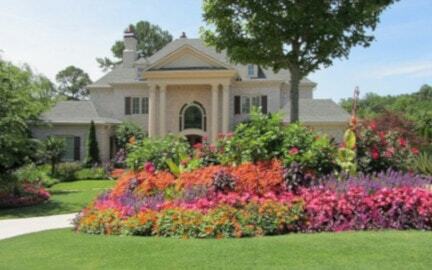 Green Yard Gardeners strives for your complete satisfaction with the project. We will continue to check in with our clients, even after the project is finished to ensure that the customer is still enjoying the project. A referral from our clients is the best compliment we can receive!